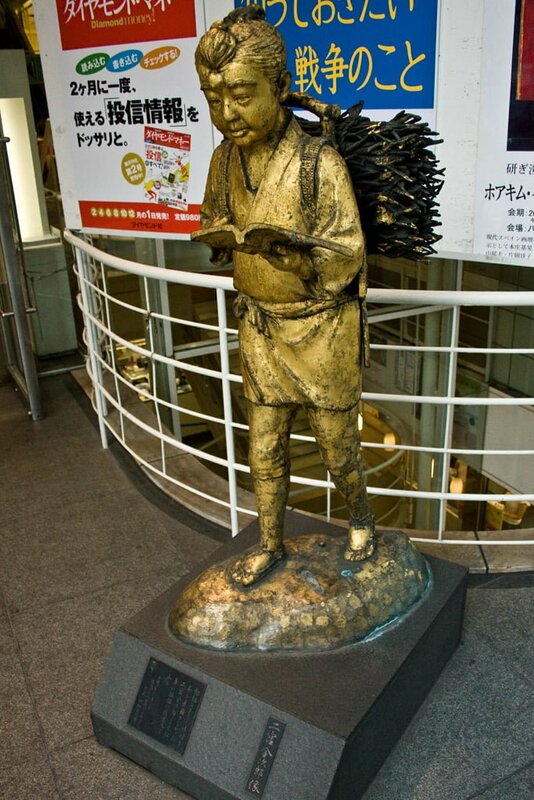 If you’ve ever been to the Yaesu Book Center near Tokyo station, you may have noticed this unusual statue of a young boy reading a book while carrying a load of firewood on his back. His name is Kinjiro Ninomiya, and the story behind the statue is a very interesting one. Kinjiro was born in 1787 into a poor farming family in present-day Kanagawa prefecture in central Japan. His parents died when he was young and he was raised by an uncle who had a large collection of books in his house. Kinjiro wanted to spend his time reading books, but his father forced him to work, so he began taking books with him as he worked delivering firewood, and at night. Kinjiro eventually became very wealthy and influential, and was hired by the local lord to rebuild the family’s treasury. His finacial policies became famous, and spread throughout the country, making him very famous. He became a symbol of thrift and diligence, and in the pre-war years, thousands of Kinjiro statues were created, and placed in elementary schools all over Japan. Unfortunately, most of them were melted down during the war, and when it ended, his name had become wrongly associated with the right-wing military movement that had caused the war, so there are very few of these statues left today.